Chicago’s best tailgate race bringing Big Ten fans together! This was the 7th annual 10k run and 5k run/walk for the BTN (Big Ten Network) Big10k. This race kicks off the start of college football season at Chicago’s soldier field. Nearly 8,000 people participated in this year’s event, many of them dressed up sporting their school colors. This year’s race Grand Marshal was the one and only Bill Murray; Big Ten fans were excited to see him there. He spent all morning cheering on athletes and talking selfies with runners. He also donated $5,000 to each of the race partner charities: Alive Rescue and Special Olympics Chicago. One of the coolest things about the BTN Race is its unique swag. The race registration includes your very own technical race shirt in your selected school colors; it also includes an awesome medal, beer and food tickets for the post-race tailgate party. Awards and cash prizes are presented to the top five male and female 10K finishers, the Big Ten Bonus prize is given to the first male and female who are current or former students at a Big Ten university, and age group awards for top three finishers in each category get football trophy awards. The weather was in the high 70’s; it was a sunny and beautiful summer day in Chicago. The temperatures warmed up a bit later in the day allowing people the take full advantage of all the post-race festivities. 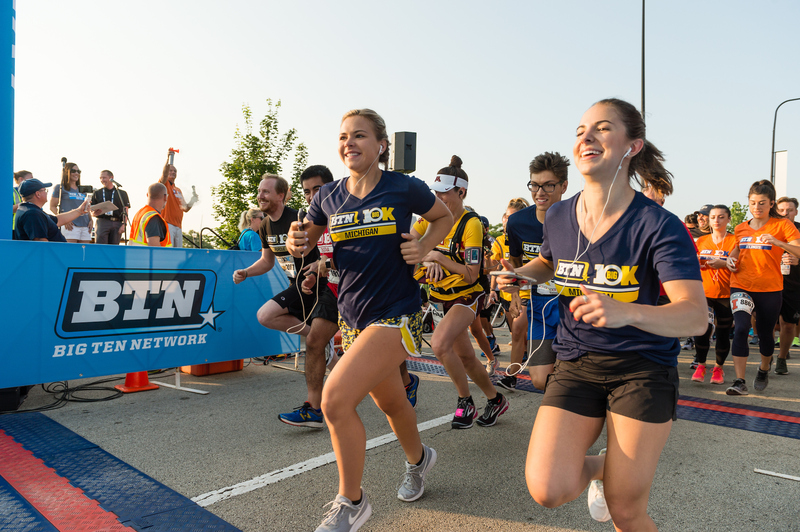 The course takes runners south on the lakefront path for three miles down to 41st Street and back to Soldier Field to the finish line. The lakefront path is narrow but the race had several waves, which help keep the congestion to a minimum. Aid stations were located every mile and a half, and offered plenty of water and Gatorade; the volunteers were amazing. This year’s post-race Tailgate party included mascots, cheerleaders, food, music, beer, tailgate games, exciting prizes, BTN talent, what else do you need! I have never seen a post-race party celebration like this. It was an awesome scene. People were having fun playing games, splashing in the slip and slide, and enjoying the beautiful weather and breathtaking views of the Chicago skyline and the lakefront. Huge congratulations to all finishers, thank you to all the volunteers, the Big Ten Network and especially Erin Harvego for organizing such a terrific event and having me there. 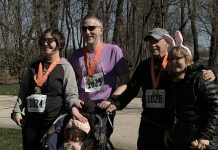 If you are looking for a fast, fun and family oriented race, this is an excellent one to add to your bucket list as a Chicago favorite. Erika is originally from Mexico City, and has lived in Chicago for the past 12 years. Erika has ran 30 marathons, including Boston and a few ultras and trail races. 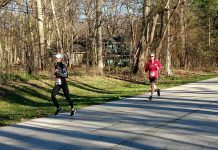 After several chronic injuries, she got into triathlons to cross train and stay active, and she fell in love with endurance distance triathlons. She has completed six Ironman and is looking to qualify for KONA.